Eleanor Cannon wants a chief executive with a passion for golf and commercial acumen. Picture: John Devlin. Scottish Golf chair Eleanor Cannon is looking for a new chief executive officer who can “reignite the game” and show “real ambition” for both clubs and elite amateurs. The post became available when Hamish Grey stepped down in March, just three months after he was appointed to run the new unified body, though the Kiwi had served in the same Scottish Golf Union post since 1998. A “six-figure package plus benefits” is being offered and applicants are now being whittled down. “What we are looking for is an exceptional leader who can take people with them and reignite the game in Scotland,” Cannon, a senior partner at the Rubicon Partnership, a Glasgow-based executive coaching practice, said. “We will be looking for that to be achieved with a mixture of a willingness and passion to get close to the clubs but, at the same time, be ambitious for the clubs and the game. “There is something about a CEO being really connected at grassroots level. In this instance, understanding the grassroots of the game in Scotland [and] the challenges that are in place but tackling them with a real ambition. “I think that person also has to have a commercial acumen so they can understand the levers and how to harness individuals to get the whole sport in Scotland around the same priorities. We have a real danger of trying to do too many things, so we have to be really focused. Both the R&A and the European Tour appointed people from outwith golf – investment banker Martin Slumbers and Keith Pelley, who has a sport and media background – as their new chief executives recently. Will Scottish Golf be going down the same road or is there a possibility of a former player – the likes of Gordon Cosh, Gordon Sherry or Dean Robertson, for example – being chosen to lead the amalgamated body? “We need both,” replied Cannon. “I’m not saying it won’t be a non-golfer. But what I am saying is that will be someone who gets golf and is passionate about golf and who is ambitious for golf and does have the commercial acumen. In addition to Grey’s departure, events manager Daniel Sommerville has moved to the R&A to become rules manager since Scottish Golf came into effect on 1 October. Both are challenges Cannon and her fellow board members are facing head on. “How have the first six months gone? I’m very pleased in terms of us having a great board in place,” she said. 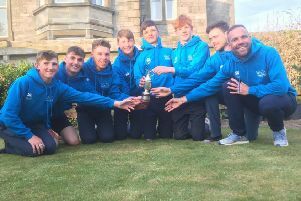 “There’s a lot of hard work going on, both within Scottish Golf but, more importantly, in the clubs as that’s where I think the big challenge lies as it is hard work running a club from a volunteer perspective. These guys need support and that’s what we are absolutely committed to doing. “Am I pleased where we are at? We’ve had a lot of work to do in terms of putting things in place. I think there’s a buzz around golf. I think that people can feel change, sense it and they want to be part of it. The advert for the CEO’s post mentioned a “revolutionary strategy”. What does that mean? “You know what, people say to me, ‘Eleanor, the game of golf is about 18 holes’ but the people who say that are ones who are probably approaching the end of their careers,” she said. “This is about creating formats that excite and motivate young people and young families. We want them to be able to come along to a golf club, get to know it by playing together and, if not together, they can play a format that allows them to be back home within a couple or maybe three hours.